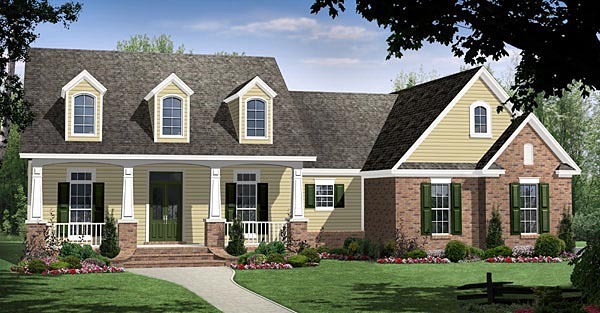 This inviting home has country styling with upscale features. The front and rear covered porches add usable outdoor living space. Great room is vaulted with built-in cabinets and gas fireplace. The spacious kitchen has an island with an eating bar. The hall bath is equipped with dual lavatories for convenience. The guest bedroom has walk-in closets with a full bath conveniently located across the hall for use by other family members. There is a flex space which could be used as a computer center, nursery, home gym, or extra closet. The master bedroom has a raised ceiling and opens into the well equipped bath with dual lavatories, corner tub, and separate walk in closets. The spacious laundry is located on an exterior wall for efficient dryer operation. Future space upstairs could be a playroom, extra bedroom, or just extra storage. The flex space could be used as a home office, dining room, or playroom. This is a very flexible home with lots of options. Question: can this plan be built on piers and off the ground?